The Kilmore International School's motto is “Exellentia Academica Persequenda” and determines our practice: in pursuit of academic excellence. 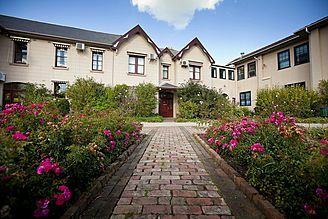 We are a boarding and day school conveniently located in a safe rural setting in the township of Kilmore north of Melbourne. The school has a family atmosphere where girls and boys from Melbourne, country Victoria and from around the world become part of a close-knit learning community. The Kilmore International School has an impressive record of academic success in the International Baccalaureate Diploma Programme. Our inspiring, experienced and highly qualified teachers enjoy an exceptional relationship with their students, most of whom will attend leading universities throughout the world. As a boarding school and home to students from around the world, pastoral care lies at its heart. The Heads and Homeroom teachers know their students thoroughly. We provide a rich variety of co-curricular activities to foster experiential learning and leadership. We believe an international education equips students to be world-ready and prepares them for university and successful careers. We invite you to visit our school to discover why. Senior School students are engaged on a journey marked by common and binding intellectual and social experiences that they will remember all their lives. In Years 11 and 12 our students embark on the 2-year International Baccalaureate Diploma Programme. The IBDP is a demanding two-year programme of study of the traditional academic disciplines. It emphasises inquiry-based and independent learning as well as rigorous assessment, exactly the skills needed to succeed at university. With evidence that IB students perform better in higher education than their peers, the Diploma is recognised and welcomed by leading universities and colleges around the world. The teaching staff are highly qualified subject specialists and IB examiners. Specialist career counselling is also provided. An international education prepares students for an interconnected world. Based on the ideals and experience of citizenship, personal character and leadership, we equip our students to flourish when they attend universities in Australia and overseas. Students in Years 10, 11 and 12 can apply for leadership opportunities as School Captain, House Captain, Service Captain or Publications Captain. When our students graduate, they are World Ready.